Prior to receiving my non-cognitive evaluation, I completely forgot that this was one aspect of our medical education. Although I kind of knew what to expect when I received my second round of TBL peer feedback, it still stung to read those comments. I don't think anyone takes constructive criticism well because it is inherently personal in nature and draws attention to our flaws, whether we are willing to admit them or not. Regardless, it's important to always strive for improvement and my non-cognitive performance doesn't escape this scrutiny. 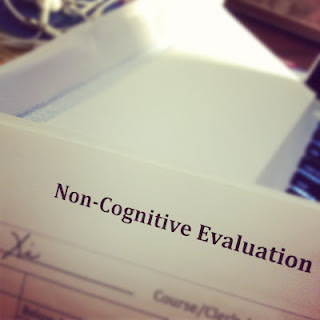 We only received evaluation forms back from our Neuroscience and Medical Humanities courses. Once again, I wasn't particularly surprised by the marks. The forms were set up with specific "areas" such as "Explain things clearly to others" or "Sense and respond to others' feelings" and a set of ratings and comments that included the options: Below Average, Average, Above Average and Not Observed. Even though there weren't a ton of comments provided, the few that were reminded me of how important it is to establish relationships with everyone within the field. In the end, our faculty and staff are our team members. I will rely on them for my education and recommendations and someday, I'll be able to give back. These non-cognitive evaluations won't end up in my permanent file, but they are a good way to remind us that there's more to success in medicine than just academic performance.